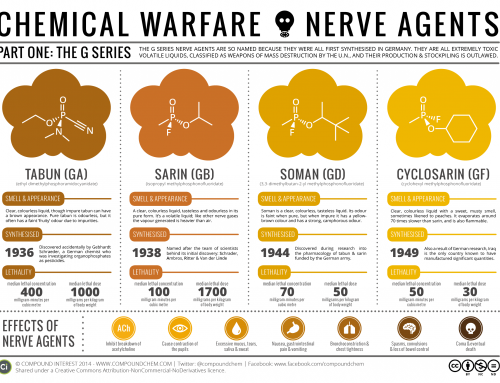 It’s been a little while since the last post on chemical warfare agents on the site, in which we looked at the G series nerve agents, including sarin and tabun. 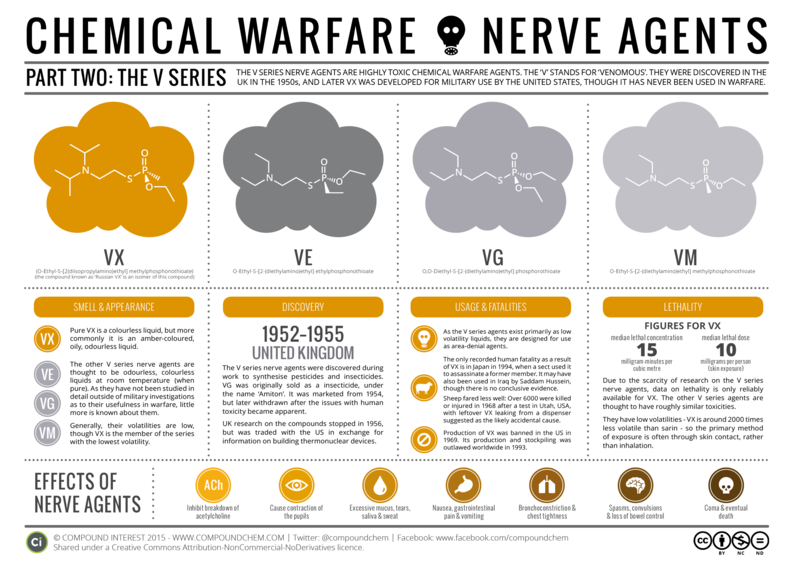 The second of the two graphics looking at nerve agents focuses this time on the V series, including the infamous VX. The V series compounds were synthesised after World War II, unlike the G series compounds. Like the G series, they were essentially discovered by accident; scientists in the UK in the 1950s aiming to synthesise new pesticides and insecticides stumbled across a series of organophosphate compounds, which appeared to be good candidates for these uses. In fact, one of them, branded ‘Amiton’, was marketed as an insecticide from 1954, although it was fairly rapidly withdrawn after the human toxicity of the compound, now known as VG, became apparent. By the time this occurred, it was clear that this particular set of organophosphate compounds were of far too great a toxicity to have any agricultural use. However, the British military had gotten wind of the high toxicity of the compounds, even before Amiton’s release, and requested further information. They carried out tests which eventually led to the development of VX, and the naming of the series of compounds as the V (venomous) agents. Britain denounced chemical warfare, and suspended research on the compounds in 1956. However, they traded their research on VX with the Americans in the mid-50s for information on the building of thermonuclear devices. As a result, US research into the V series compounds continued, and in 1961, VX, identified as the most promising agent from the group, was put into mass production. Details of most of the tests carried out by the US on VX remain classified. The few that we do know about don’t exactly paint those who were involved in planning the tests in a brilliant light. Whilst no human fatalities are recorded as a result of the tests, in 2002 the US admitted that nerve gases including VX and sarin were tested on sailors, likely without their informed consent, by showering them onto the deck and injecting them into the ventilation system of their ship. 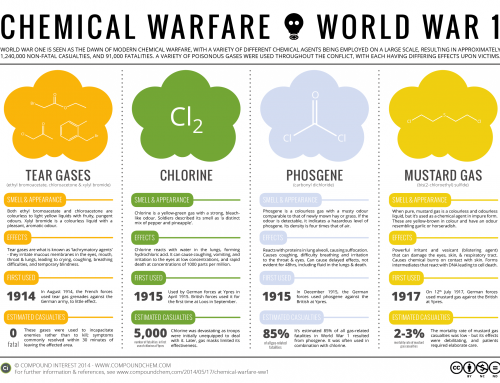 Tests of this nature were conducted throughout the 1960s, and it’s estimated that around 4,300 servicemen may have been exposed to various chemical agents. In 1968, shortly before President Nixon issued a ban on open-air chemical weapon testing in 1969, thousands were killed in an incident involving VX in the US. These fatalities were not humans, however, but sheep. Full documentation on the incident in Utah was only released to the public in 1998, and suggest that a plane carrying empty canisters of VX back from a test leaked some remaining VX into the appropriately named ‘Skull Valley’ in which the sheep were grazing. This caused death or injury to over 6000 sheep. This being the midst of the cold war, the Soviet Union was also working on its own V series agents. They developed VR, also known as Russian VX, an isomer of the VX developed by the UK and the US. The toxicity of VR is comparable to that of VX, though it exerts its effects even more rapidly, meaning the window for administration of an antidote is shorter. Little more is known about the other identified V agents, as once research for commercial pesticide use ceased, only military scientists worked on the compounds, and much of this research is not in the public domain. As far as the effects of the V series nerve agents go, they are much the same as those of the G series, which are also organophosphate compounds. They all inhibit the breakdown of the neurotransmitter, acetylcholine. This chemical is responsible for telling muscles to contract – when its breakdown is prevented, it prevents muscles from relaxing, which can in turn lead to a range of other effects indicated in the graphic. VX is the most toxic nerve agent ever synthesised, with a median lethal dose of just ten milligrams. As with the G series, atropine is commonly used as an antidote to the V series nerve agents, and works by blocking acetylcholine receptors in the body. Members of another family of compounds called oximes are sometimes used in conjunction with atropine; they work in a different manner, restoring the enzyme that helps break down acetylcholine to working order. However, even these antidotes cannot be enough to save a victim if a large enough exposure to a nerve agent has been experienced. 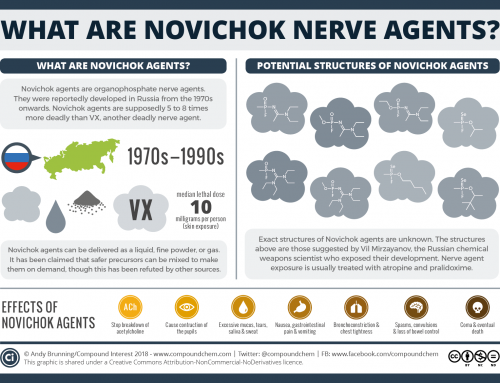 Synthesis and stockpiling of the V series nerve agents was banned by the Chemical Weapons Convention of 1993, though some countries, including the US and Russia, are still in the process of destroying their stockpiles. As far as we know, VX has never actually been used in warfare; there was suspicion that Saddam Hussein may have used VX in Iraq, but this was later shown to be unlikely. As such, the only confirmed human fatality is that of a Japanese sect member in 1994, who was killed with VX by other sect members who suspected he was a spy.